This web site would not exist without my girlfriend Cindy, who originally bought it through our friend Carmen Alcorn as a Christmas / birthday gift and encouraged me to set it up. So, thanks, Cindy! 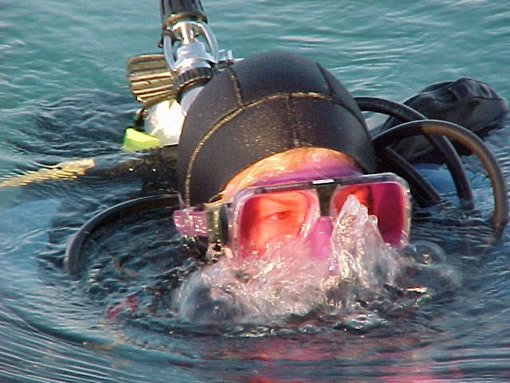 She is also a diver who has been diving the Great Lakes longer than I have. This spot is reserved for her to put up anything she wants. About the photo: Cindy LaRosa on the surface after another Great Lakes wreck dive. This was a Lake Erie Wreck Divers (LEWD) and AquaMasters trip aboard Osprey Charters in the eastern basin of Lake Erie on July 10-11, 2004. Photo by Greg Ondus.